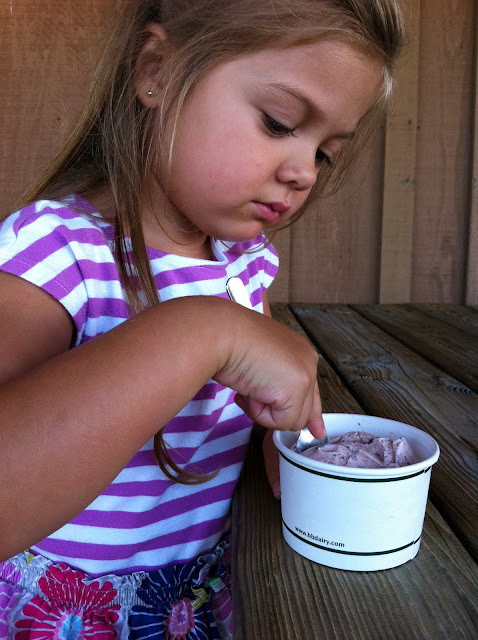 A few weeks ago I received an email from a list serve I am on about the Maryland Ice Cream Trail, which I had never heard of before, but the words "ice cream" will always get my attention. The email took me to this link where I read all about the 7 dairy farms in Maryland that make and serve their own ice cream right on the farm. Unfortunately, discovering this in August means that we probably won't get to too many of them this year, although I feel an Ice Cream Tour coming up for next summer. We did however go and check out one of them, Broom's Bloom Dairy which is located in Bel-Air just a few minutes off of 95. When we arrived we found a smallish building with solar panels on the roof sandwiched between a large corn field and a giant field of sunflowers, which we were very excited about. Broom's Bloom has delicious lunch options and a great kid friendly selection. The girls had a grilled cheese sandwich with the best Cheddar cheese I have had in a long time. I had a delicious quiche and we shared some juicy summer cantaloupe with vanilla yogurt for dipping (everything home made.) Of course eating lunch was really just a pre-requisite for eating ice cream. They gave the girls each a little plastic disk to bring back in when they had chosen from the many, many ice cream flavors they have (which change frequently.) The Bee opted for strawberry chip, the bean for oreo cookie and I had the chocolate chip, they were all delicious. One of the nicest parts of eating at Broom's was that we sat outside (although they do have lots of indoor seating too) at a large picnic table on a beautiful covered porch, complete with wooden rockers, next to a large field that the kids played in when they were all done. To say Broom's Bloom is one of our favorite new places is an understatement and we will definitely be back!